MELBOURNE, Australia — Images published online appear to suggest China has mounted what looks to be a prototype electromagnetic railgun on a ship, and started trials with the possibility of testing it at sea in the near future. If confirmed, this would make China the first country in the world to mount such a system on board a ship and take it out to sea. The series of photos on social media shows a large turret with what appears to be a gun barrel mounted on the front of the Haiyangshan, a 7,000-ton Type 072-III Landing Ship Tank of China’s People’s Liberation Army – Navy or PLAN. Three standard sized containers are mounted on the ship’s open deck immediately aft of the turret, which are believed to be the generators and other associated equipment needed to power a railgun. Other modifications on the ship seen in the published photos also include a new additional observation gallery and an unknown sensor atop the original superstructure, which is believed to be a control room and observation platform related to the railgun. The bow doors used for conducting amphibious operations has also been welded shut. It is not known where the modified ship was photographed, although the Haiyangshan was previously known to serve with the PLAN’s East Sea Fleet. The ship has made at least one voyage post-modification, suggesting underway trials to test the seaworthiness of the modifications has begun. The choice of the Type 072-III to mount such a weapon would instead of the PLAN’s Type 909 weapons testing ship would seem strange, however analysts have suggested that the power requirements of the railgun may have exceeded what the Type 909 can generate, hence the need to mount in on a Type 072-III, which has ample space above and belowdecks to accommodate power generators and other equipment. The new carrier is based closely on the PLAN’s sole operational aircraft carrier, Liaoning, with an angled flight deck and a ski jump for short takeoff but arrested recovery operations. Despite the name, railguns use electromagnetic forces to launch high velocity projectiles by means of a sliding armature that is accelerated along a pair of conductive rails. The projectiles normally do not contain explosives, relying on the projectile’s high speed to inflict damage. The electromagnetic forces impart very high kinetic energy to a projectile, easily exceeding that produced by explosive fired guns. Other advantages are the absence of explosive propellants or warheads to store and handle, as well as the low cost of projectiles compared to conventional weaponry such as cruise missiles, while the high speed of their projectiles make them difficult to defend against. The United States Naval Surface Warfare Center’s Dahlgren Division has demonstrated a railgun firing 3.2 kg (7.1 lb) projectiles in October 2006 as a prototype of a more powerful weapon to be deployed aboard Navy warships. Development of this technology is continuing, with the Office of Naval Research demonstrating in mid-2017 the ability to launch a “multi shot salvo” of two projectiles in a 12-second span. 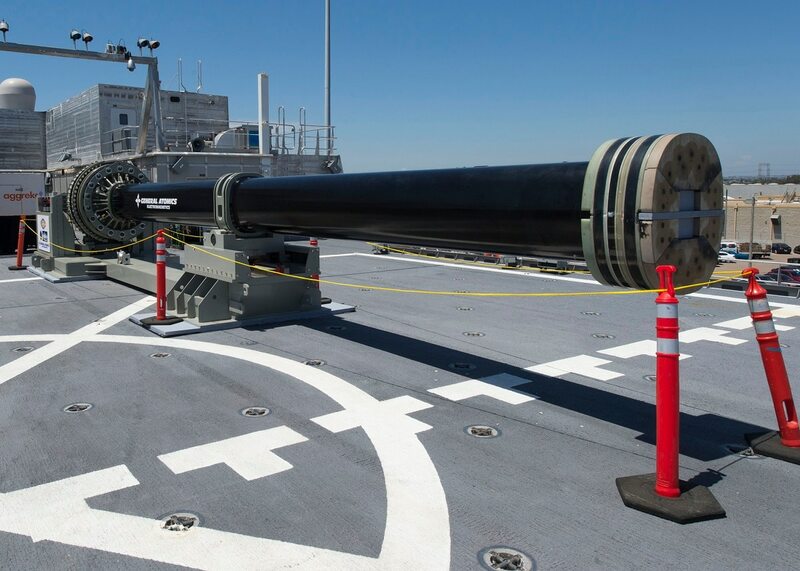 However, these are land-based systems, and no railgun has yet been fitted on to a ship of the U.S. Navy although plans a afoot for ship mounting and integration tests this year.